The FMVA is CFI’s Financial Modeling & Valuation Analyst (FMVA)®FMVA™ CertificationThe Financial Modeling & Valueation Analyst (FMVA)™ accreditation is a global standard for financial analysts that covers finance, accounting, financial modeling, valuation, budgeting, forecasting, presentations, and strategy. program that is designed to teach practical applications of accounting, Excel, finance, financial modeling, valuation, presentations, and other critical skills that financial analysts need. The program consists of 12 required courses, each with a qualified assessment at the end, and all are available 100% online. Why Take the FMVA Program? The FMVAFMVA™ CertificationThe Financial Modeling & Valueation Analyst (FMVA)™ accreditation is a global standard for financial analysts that covers finance, accounting, financial modeling, valuation, budgeting, forecasting, presentations, and strategy. certification was designed to fill a gap in the market for financial analysts. Traditional universities are mostly focused on theory and employers often find that new hires are not up to speed on the full skill set that’s required for doing top-notch financial analysis. Additionally, established professional designations are too focused on specific niches such as portfolio management, alternative assets, or just accounting, and require candidates to learn additional necessary material themselves offline (textbook based). Learn more about success stories from CFI’s Financial Modeling & Valuation Analyst (FMVA)FMVA™ CertificationThe Financial Modeling & Valueation Analyst (FMVA)™ accreditation is a global standard for financial analysts that covers finance, accounting, financial modeling, valuation, budgeting, forecasting, presentations, and strategy. certification program and how it can help you stand out in a competitive job market. The first step in becoming a certified financial analyst is to enroll now onlineFMVA™ CertificationThe Financial Modeling & Valueation Analyst (FMVA)™ accreditation is a global standard for financial analysts that covers finance, accounting, financial modeling, valuation, budgeting, forecasting, presentations, and strategy. . From there, you can start planning your learning schedule and the courses you are required to complete. Below is a summary of the requirements. Candidates must complete each of the required 12 courses with a passing grade of 80% or higher on the final assessment. Upon completing each course, you will automatically receive a certificate of completion. Once the 12 requirements are completed, the official accreditation of Financial Modeling and Valuation AnalystFMVA™ CertificationThe Financial Modeling & Valueation Analyst (FMVA)™ accreditation is a global standard for financial analysts that covers finance, accounting, financial modeling, valuation, budgeting, forecasting, presentations, and strategy. will be issued to you. CFI’s program is completely focused on practical skills in finance and accounting. 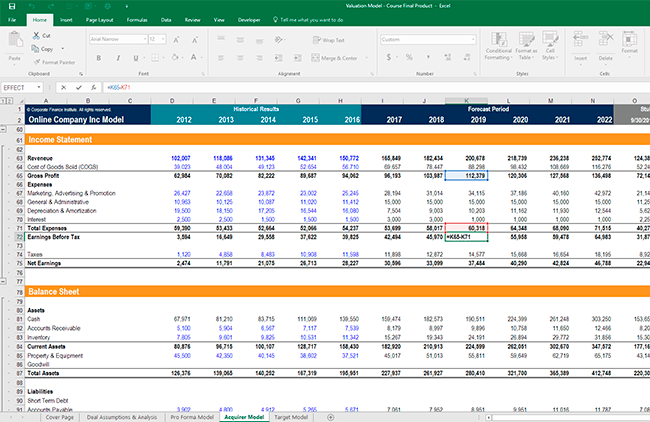 This means using case studies of both real and fictitious companies combined with Excel and PowerPoint to organize, analyze, and interpret financial data. CFI is the official global provider of the Financial Modeling and Valuation AnalystFMVA™ CertificationThe Financial Modeling & Valueation Analyst (FMVA)™ accreditation is a global standard for financial analysts that covers finance, accounting, financial modeling, valuation, budgeting, forecasting, presentations, and strategy. certification program. With professional instructors from Vancouver, London, New York, and Hong Kong, CFI’s team is uniquely qualified to deliver the training and instruction required for this designation. In 2017, CFI registered over 40,000 students in its various courses and programs. CFI’s mission is to help anyone become a world-class financial analyst and advance their career. OFFICIAL: Financial Modeling & Valuation Analyst (FMVA) programFMVA™ CertificationThe Financial Modeling & Valueation Analyst (FMVA)™ accreditation is a global standard for financial analysts that covers finance, accounting, financial modeling, valuation, budgeting, forecasting, presentations, and strategy.